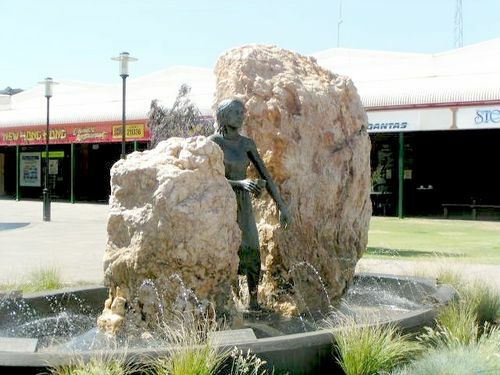 Fountain & Statue of the Patron Saint of Miners, Saint Barbara, commemorates a century of mining on the Goldfields as well as commemorating those who have lost their lives in the process. According to legend, Barbara was the lovely and intelligent daughter of a wealthy heathen named Dioscorus who lived near Nicomedia in Asia Minor. (Turkey). One of her tutors was a Christian who secretly introduced Barbara to the Christian faith. Because of her beauty and fearful that she may be demanded in marriage and taken away from him, Dioscorus jealously shut her up in a high and strong tower. He commissioned a bathhouse to be built for her and was enraged when she added another window so that the three windows might symbolise the Holy Trinity. Her father was infuriated when Barbara acknowledged that she was a Christian. He turned her over to the Roman authorities who scourged her, but her wounds healed immediately. She was taken before the prefect Martinianus, a historical figure noted for his brutality. Softened by her beauty, Martinianus gave her a choice. Renounce your god or die a terrible death. She refused to give up her faith. She was taken away, tortured and condemned to die. Dioscorus took his own daughter`s life with a blow from his sword. Afterwards, he was struck by lightning and his body consumed. Saint Barbara was martyred in 306 AD. Her legend did not emerge until the 7th century. The legend of the lightning bolt caused her to be regarded as the Patron Saint in time of danger from thunderstorms, fires and sudden death. When gunpowder made its appearance in the Western world, Saint Barbara was invoked for aid against accidents resulting from explosions. She became the patron, not only to miners, but also artillerymen, builders, stonemasons, gravediggers and sailors. Mines, mountains, churches and other places bear her name. Barbara`s feast day, December 4th, appears on the most ancient holy day calendars. For The City Of Kalgoorlie - Boulder. On The 4th December 1999.